Jamie Kruse and Elizabeth Ellsworth of the media-art research-group Friends of the Pleistocene ("dedicated to exploring the conjuncture between landscape and contemporary human activity at sites shaped by the geologic epoch of the Pleistocene") tour the gold vaults at the New York Federal Reserve, and think about them from the perspective of geology. The vaults are built on the granite bedrock underneath Manhattan, a site which can support the weight of "the largest known concentration of gold in the world" (which makes you wonder about all those unknown concentrations of gold). They hold about 7,000 tons of gold, worth around $275 billion. Around 120 different organizations, nations, and banks store their gold at the Fed. That's interesting from a purely monetary point-of-view - but the bank, Kruse and Ellsworth note, is also "a place where humans have encased geology within geology." If you start in the vault at the core of the building and work your way out to the street, you travel through cosmic and geologic time. The gold behind the blue gates is pre-earthian. This purified element was born of supernova (of the type II variety) shortly before the earth coalesced. Next you pass through solid Manhattan bedrock (450 million years old), up through the buildingâ€™s walls composed of Indiana Limestone (Middle Mississippian, 335-340 million years ago) and Ohio Sandstone (Early Mississippian, 350 Million years). "Finally," they write, you "exit onto the street. There the Anthropocene rules." The bank has its quirks: when gold is exchanged between clients, someone actually puts the gold bars on a trolley and carts them from one area to another, and the sharpshooting guards practice at an indoor shooting range. But it's the geological bizarreness of the undertaking which is fascinating here. 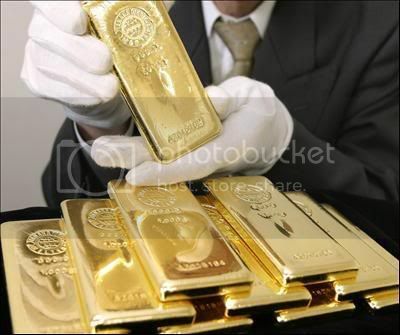 One bar at a time, bankers have created a huge gold nugget in a place where there was none before. Friends of the Pleistocence aims to "create contexts and speculative tools for humans to recalibrate their sense of place within the geologic timescale." This is actually only the latest in a larger series of posts they're doing on the geological history of New York called Geologic City. Today's Relationship Therapy: Now More Postmodern!